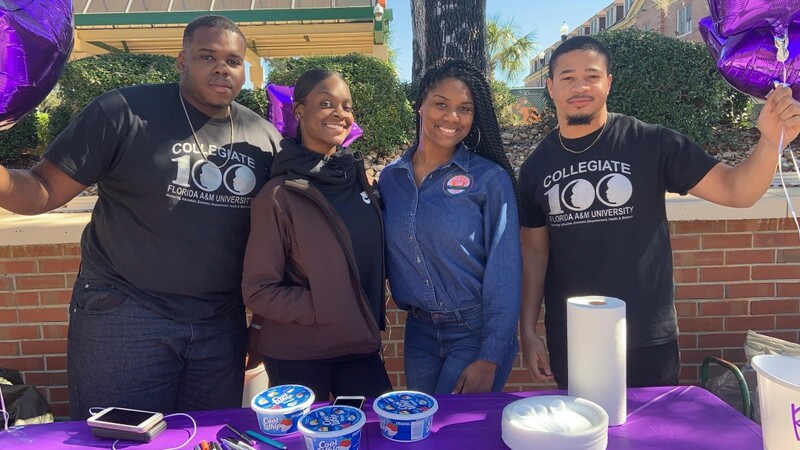 Alexys Lynn and Ashlyn Freeman with Collegiate 100 members raising money for Relay for Life during Set Friday. Photo Submitted by Alexys Lynn. On April 19, FAMU will participate in the fight against cancer with Relay for Life. Relay for Life is a fundraising event where team members take turns walking around a track or designated path. Each event is 6-24 hours in length and each team is asked to have a member on the track at all times to signify that cancer never sleeps. “Cancer patients don't stop because they're tired, and for one night, neither do we,” according to the Relay for Life website. The fundraiser will be held from 8 p.m. April 19 to 8 a.m. April 20 at the FAMU track. Student organizations can get together and raise money by doing fundraisers, accepting donations, or doing much more. Alexys Lynn, a sophomore broadcast journalism student, serves at the chairwoman for the 2019 Relay for Life. Lynn pitched the idea in November to give FAMU a more positive look. “FAMU hasn’t done many community service university events. By doing this big community service event we’ll have a positive look on FAMU,” Lynn said. Even though the Relay for Life committee would like to have a total of 50 organizations participating, right now only 27 student organizations have signed up. This event is not only about honoring the people who were victims of cancer, but also the people who survived. At 11:15 p.m. the event will hold a special session to honor people who’ve won the battle along with people who are still fighting. “We will have a luminaria session, which will be a candle light forum for cancer survivors and for people who currently have cancer and people who have passed away,” said Lynn. Luminarias are lanterns consisting of a votive candle set in a small paper bag weighted with sand. Each candle will start at $10; you can pick up the paperwork in student government. The event will last 12 hours and to keep the teams entertained FAMU organizations will be performing. As of right now, the list of performers is not available. So far, they have raised almost $3,000 of their $50,000 goal. To help raise money Lynn sets up a table at Set Friday where organizations can be pied for a dollar. So far SISTUHS has raised the most money with a total of $191. Alpha Xi Ke, is second with $100, and even the chairwoman herself has donated $94. Ashlyn Freeman, a sophomore political science major, volunteers at Set Friday to lend her hand in the fight against cancer. Freeman is also part of the process that goes into putting on this all-day event. She services as the committee head who is responsible for informing internal and external organizations about the event. Freeman joined Relay for Life because of her interest in helping people. “I decided to involve myself in Relay for Life primarily because I have a special interest in helping others in any way I can. In addition, with there being so much darkness in this world I believe any positive deed brings an overflow of light,” she said. Freeman hopes to touch a person’s life with this event. “I am hoping that I will be able to touch or impact someone’s life whether directly or indirectly through my active participation in Relay for Life,” she said. People who are interested in helping with the event can stop by the second floor of Efferson Student Union, which is the FAMU Student Government Association and asking for a Relay for Life sign-up packet. Organizations can send at least two members to the team captain interest meeting happening Wednesday at 6 p.m. in the senate chambers. Anyone who has questions is urged to contact Alexys Lynn at Alexys1.lynn@famu.edu.